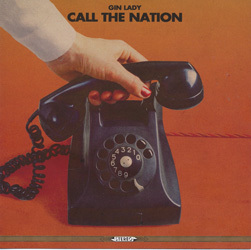 ‘Call The Nation’, Gin Lady’s third album, sees the band in almost obscenely good health. Having evolved from Black Bonzo to become one of the earlier bands to tread a path back to the Seventies and releasing their self-titled debut back in 2012, Gin Lady (now featuring vocalist Magnus Kärnebro, guitarist Joakim Karlsson, bassist Anthon Johansson and drummer Fredrik Normark) seem as happy as can be to revel in a bathtub full of retro rock; and listening to ‘Call The Nation’ is like tuning in to your favourite radio station back in days when tennis was governed by Björn Borg, the pop charts were ruled by Abba and no-one in the UK had heard of IKEA. Or maybe that was just me. ‘Call The Nation’ takes on where its predecessor ‘Mother’s Ruin’ left off. One part Rolling Stones, one part Montrose, a smattering of Nazareth and a whole heap of attitude, it’s an album that personifies the classic rock sound of days gone by. At just 36 minutes the CD captures the perfect running time of an LP, and the cover image with its Bakelite telephone and ‘stereo’ caption, and ‘to be played at maximum volume’ slogan on the rear all give substance to the illusion that you’re listening to an artefact from the past rather than a stonkingly good album from the here and now. And although the Swedes embrace – maybe even wallow in – musical nostalgia with open arms they’ve developed an identity and sound of their own, so although they might appear at first listen to be an amalgam of greats gone by they’re actually very much their own band with plenty to say and plenty of talent to back it up. You want highlights? They come thick and fast, but ‘Ain’t No Use’ (which at almost seven minutes is by far the longest cut on the album) is a beautiful slow-burner with a sting in its tail, ‘Down Memory Lane’’s staccato riff is almost impossible to get out of your head once you’ve heard it, and the title track’s laid-back vibe and funky shuffle is pretty much worth the price of the album alone. Top cat for me though has to be ‘Heavy Burden’, an immensely catchy song in the vein of Schenker-era UFO with some understated playing that just leaves you begging for more. Great album, great band; more, please!